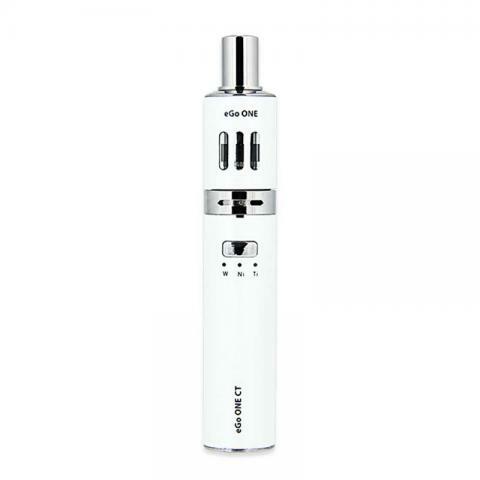 Joyetech eGo One CT Vape Kit - 1100mAh, applies Joyetech constant temperature technology. CT-Ti (Titanium)/CT-Ni (Nickel)/CW modes are available. We have pearl white, water blue and cherry red colors. It works with eGo One atomizer heads. I love this device. Hands down is the easiest no mess no fuss device I've ever used. The only con I have is the nickel and titanium coils don't produce as much flavor as the kanthal. That is not a deal breaker though. I own 2 of these and would highly recommend them to anyone wanting to sub ohm without the huge mod. These are also perfect for camping. Lightweight, long battery life and super fast charge. Joyetech eGo One CT Starter Kit is a 1100mAh capacity. It is Cheap and of high quality. Original Joyetech Ego One CT Starter Kit 1.8ml/1100mah, 2.5ml /2200mah with good Temperature Control.